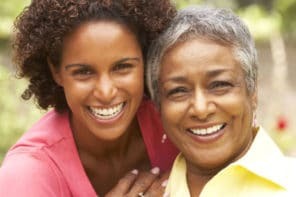 Since family caregivers don’t get formal training in safe lifting and transfer techniques, it’s easy to hurt yourself while helping others. 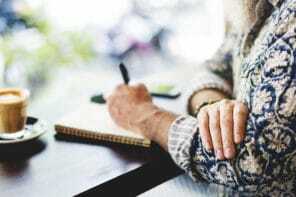 These tips allow you to confidently help your older adult move from wheelchair to toilet while also saving yourself from injury. By the way, helping someone move from one position to another is often referred to as a transfer. This 5 minute video gives a real-life demonstration on how to safely transfer from wheelchair to toilet. A young woman uses safe lifting techniques when helping a taller man. Don’t be discouraged if the steps she uses seem complex. After doing it a few times, you’ll quickly get the hang of it. Besides, staying injury-free is worth a little practice, right? Always protect your back by bending your knees instead of from your waist. , shown in the video, to help you safely support your older adult. for support rather than holding on to your shoulders. If their legs are not strong, place your knees in front of theirs (called blocking) while they stand. This is shown at 2:45 minutes in video. If one side is weaker than the other, stand on the weaker side for extra steadiness and support. As the video shows, it takes some preparation to help your older adult from wheelchair to toilet. To reduce the chance of an accident because it takes so long to get to the toilet, make regular trips to the bathroom to reduce urgency. Try after meals and every couple of hours. Don’t wait until your older adult says they need to go – by then the need might be too urgent. 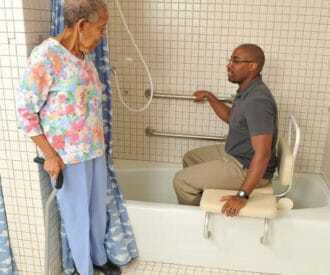 Bathroom Safety for Older Adults: Grab bars and More! Caregivers, Need a Boost? Read the Wall of Thanks! Gait belts are great for lifting patients and/or loved ones and are extremely economical! Additionally, toilet safety arms can easily attach directly to your existing toilet. For added comfort, a padded toilet seat is recommended or a raised or elevated toilet set (these come with arms too).